Finding John Lee: Part Three - Right Under Your Nose - who is nicka smith? I had started my genealogy journey with practically no information when it came to great great Grandpa John. 17 years later, instead of pushing a broke down deuce and a quarter, I was now in the driver’s seat of a brand new BMW 750 (a girl can dream, right? LOL) thanks to DNA. I could always drive away into the sunset because it just sounds awesome, right? On the other hand, I felt there had there was a larger story that was waiting for me to find it. 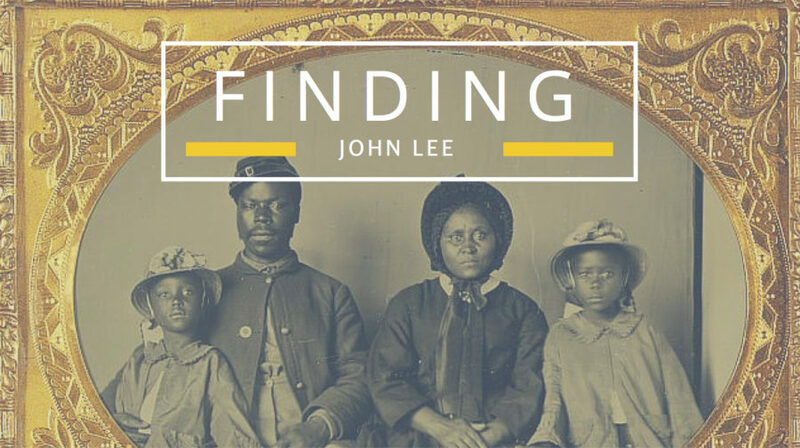 Cousin B didn’t have any information past her father, John Lee, and her paternal grandparents, Edward Lee and Henrietta Mix Lee. I didn’t have any information past my maternal grandmother, Annie Ruth Atlas, her mother, Susie Lee Atlas, and her maternal grandfather, Grandpa John. Cousin B was just starting her research journey while I had been on mine for a while. Sometimes it takes us researching a collateral (non-direct) family line for us to make discoveries about our non-collateral (direct) family line. This is especially the case when you don’t have more to go on for your branch but there’s lagniappe all over the place for your extended family. Opportunity is just thick in the air like that sometimes. Sound genealogy research begins when we to start our search with ourselves and then progress backwards through each generation with our searches and documentation. Cousin B was following all the rules and had already done a fabulous job finding her father, John, on the 1940 (1), and 1930 (2) U.S. Census. I later discovered her grandfather Edward on the 1920 Census. (3) I quickly noticed a pattern – Cousin B’s family and my family were living in the same ward in East Carroll Parish, sometimes within pages of each other, on the same census’. 1870 US Census, Frellson Plantation, Carroll Parish, LA. Clora Evans Atlas, Armstead and Jemima Lee, and Asberry Lee are noted. Source: FamilySearch.org. Before I could even scroll to find them, I noticed a familiar name. My great great grandmother, Clora Evans Atlas, mother of Susie Lee Atlas, was noted on line 4. Who appeared to be the same Asberry was noted on line 25, but with a different wife, Silvia. There was also an older couple named Armstead Lee and Jemima Lee who appeared two households before this Asberry starting on line 17. Were Armstead and Jemima Asberry’s parents? I couldn’t be sure based purely on this one record, but all roads were leading that way, especially since they were enumerated on the same page as a previously known ancestor. I continued searching and discovered that an Asberry Lee had applied for and received a pension (6) for serving with the U.S. Colored Troops during the Civil War. A private in Company B of the 47th Infantry, the service record (7) of this Asberry noted that he was born about 1841 in Carroll Parish, LA and enlisted on May 1, 1863 in Lake Providence, LA for a term of 3 years. Based on these details, this appeared to be the same Asberry from the 1870 Census. I had nothing to lose by ordering a copy of the pension file. My geneabud Angela Walton-Raji was ready and willing to head to the National Archives for me. Her texts while she was in the Archives had me giddy. She quickly sent a copy of the file to me by mail. While waiting, I searched Google to see if there was anything for an Asberry Lee or Armstead Lee living in Carroll or East Carroll Parish. To my surprise, I stumbled upon this blog post and this blog post that I wrote six years prior detailing records in the Freedmens Bureau for the Lake Providence field office. NARA 471 – David Lee, Page 54 – Company A of the 53rd Regiment of the US Colored Troops; Asbury Lee, Page 61 – Company B of the 47th Regiment of the US Colored Troops, Claims for bounty. Yes. I had come across these names six years ago and tucked them into my “genealogical rainy day fund” and completely forgot about them. 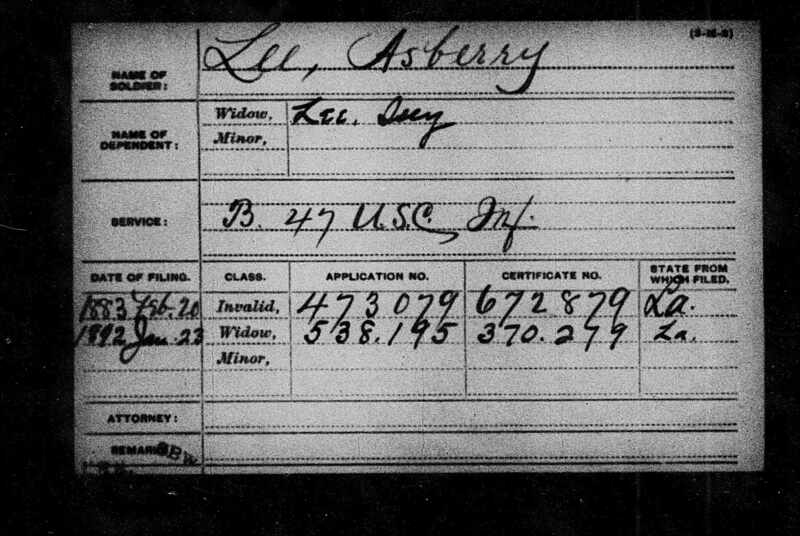 They definitely seemed to connect Asberry to Armstead and they also confirmed Asberry’s involvement in the USCT. Finally, the day came. When I opened the mailbox, I could see why Angela was so excited for me. The file was at least 70 pages! Asberry Lee’s Civil War Pension Card. Source: FamilySearch.org. This file was a goldmine. Like, literally. General Affidavit of Asberry Lee, dated August 2, 1886. Witness: Peter Matheson. I now had a clear tie to William Alling (who was mentioned in part one) who held labor contracts with who appeared to be Grandpa John, definitely my great great grandmother Clora, and Asberry Lee. I appeared to have a tie between Asberry and Armstead Lee, although Armstead wasn’t named in Asberry’s affidavit. This is based on the Freedmen’s Bureau contract above from April 1867 that does note Armstead’s name along with Asberry’s. It was safe to consider that Armstead was likely Asberry’s father, and thus Grandpa John’s father, making him my great great great grandfather and a shared common ancestor of me and Cousin B.
I appeared to have a tie between Asberry and Grandpa John, although Grandpa John is not named in Asberry’s affidavit. This is based on the the labor contract Grandpa John appeared to have with William Alling. It would be an entire blog post series to cover all that was in the file and what I discovered online afterward, but I’ll share some of the highlights. Asberrry and at least his mother, Jemima, were former slaves of James D. Kerr of Carroll/East Carroll and Claiborne Parish, LA. Kerr’s father, Joseph Kerr, was a former U.S. Senator for the state of Ohio (10). James D. Kerr left Carroll Parish sometime after 1860 and moved to Claiborne Parish, hence the reason why Armstead Lee and Jemima Taylor Lee’s marriage took place there. I eventually found Grandpa John living four doors down from Kerr on the 1870 Census in Claiborne Parish. After 17 years I never found Grandpa John in East Carroll in 1870 because he wasn’t living there at the time. (11) John, and who appears to be his wife Emmaline, had two children, a son named Asberry (go figure!) and a daughter named Martha. This second Asberry and Martha were half siblings to my great grandmother, Susie Lee Atlas. This verified the oral history we got about Susie having a brother. I’m lead to believe that Emmaline Lee on the 1870 Census with Grandpa John is the same one from the labor contract that was a hireling with Clora Evans Atlas, my great great grandmother. Asberry had been married twice – his first wife was Silvia who died and his second wife was actually named Iceyphine Powell Lee (yes, for real LOL). Hence the reason why he’s enumerated with two different women on the 1870 and 1880 census. Asberry had the following children with Iceyphine: Edward Lee, Olley Lee, Mattie Lee, and John Lee (go figure!). The preponderance of names being reused was even more proof that I was dealing with the right families. Asberry mentioned “Since the death of my father I have no one or no way to make my support. My father had a very large family, he kept them all together. I live of[f] them so the old man died January 11, 1883 and then after family left and went to Arkansas…” (12) This confirmed the oral history we got. With this information, and mentions of collateral relatives in the pension file, I was able to trace to present a couple other children of Armstead and Jemima: Albert Lee (who married Laura Bowman), Celia Lee (who married Wesley Green). DNA matches from Albert and Celia’s descendants have proven these relationships as well. Witnesses in file included other former slaves of James D. Kerr – Richmond Johnson (born about 1796), Nelson Owens (born about 1831), Georgiana Perry (born about 1841) and Monroe Stewart. (1) “United States Census, 1940,” database with images, FamilySearch (https://familysearch.org/ark:/61903/1:1:VYR1-W3R : 17 May 2014), John Lee in household of Lenell Lee, Lake Providence, Police Jury Ward 3, East Carroll, Louisiana, United States; citing enumeration district (ED) 18-5, sheet 16B, family 558, NARA digital publication T627 (Washington, D.C.: National Archives and Records Administration, 2012), roll 1399. (2) “United States Census, 1930”, database with images, FamilySearch (https://familysearch.org/ark:/61903/1:1:XMYZ-7LR : 8 December 2015), John Lee in entry for Ed Lee, 1930. (3) “United States Census, 1920,” database with images, FamilySearch (https://familysearch.org/ark:/61903/1:1:MVQ2-R45 : 14 December 2015), Edward Lee, Lake Providence, East Carroll, Louisiana, United States; citing sheet 16A, NARA microfilm publication T625 (Washington D.C.: National Archives and Records Administration, n.d.); FHL microfilm 1,820,611. 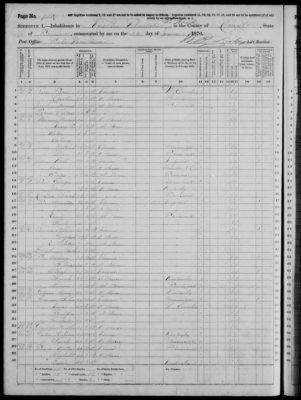 (4) “United States Census, 1880,” database with images, FamilySearch (https://familysearch.org/ark:/61903/1:1:MD6G-LG5 : 24 December 2015), Edward Lee in household of Asberry Lee, 5th Ward, East Carroll, Louisiana, United States; citing enumeration district ED 32, sheet 639B, NARA microfilm publication T9 (Washington D.C.: National Archives and Records Administration, n.d.), roll 0453; FHL microfilm 1,254,453. 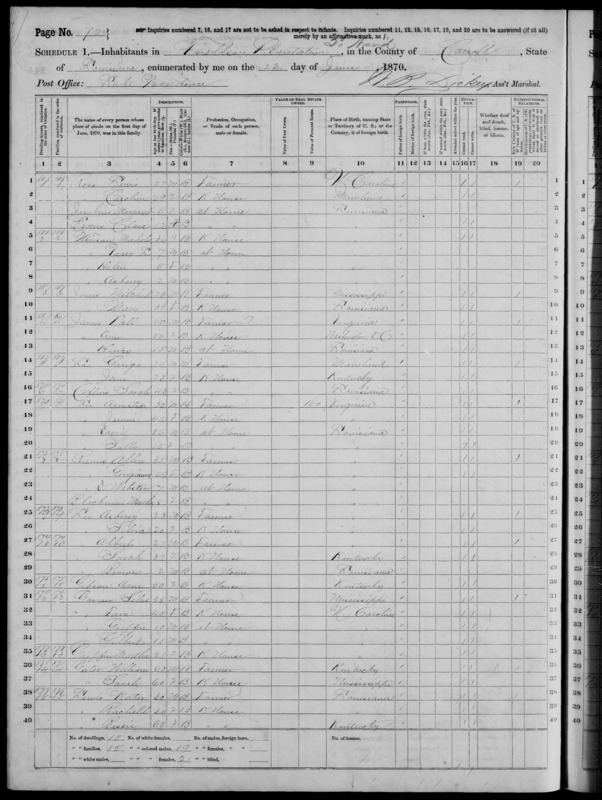 (5) “United States Census, 1870,” database with images, FamilySearch (https://familysearch.org/ark:/61903/1:1:M8QT-YQ3 : 17 October 2014), Asberry Lee, Louisiana, United States; citing p. 72, family 873, NARA microfilm publication M593 (Washington D.C.: National Archives and Records Administration, n.d.); FHL microfilm 552,008. (6) “United States General Index to Pension Files, 1861-1934”, database with images, FamilySearch (https://familysearch.org/ark:/61903/1:1:KDBW-R21 : 3 April 2015), Asberry Lee, 1883. (7) Lee, Asberry. Ancestry.com. U.S., Colored Troops Military Service Records, 1863-1865[database on-line]. Provo, UT, USA: Ancestry.com Operations Inc, 2007. Original data: Compiled Military Service Records of Volunteer Union Soldiers. The National Archives at Washington, D.C. The National Archives at Washington, D.C.; Washington, D.C.; Compiled Military Service Records of Volunteer Union Soldiers Who Served with the United States Colored Troops: Infantry Organizations, 47th through 55th; Microfilm Serial: M2000; Microfilm Roll: 10, Name Range : Knox, Solomon – Marshall, Alexander. Accessed July 18, 2016 via http://www.ancestry.com. (8) US Army Pension, Asberry Lee, widow Isey Lee, USCT 47th Infantry, Company B, invalid pension filed February 20, 1883, application no. 473.097, certificate no. 672.879, filed in LA, widow’s pension filed January 23, 1892, application no: 538.195, certificate 370.279. (9) Farley, Willie. Index, Claiborne Parish, LA, Marriage Records, 1849-1910. J&W Enterprises, 1984. Page 89, Groom: Armstead Lee, Bride: Jemima Taylor, Marriage Date: 23 Sep 1866, Book: 01, Folio: 060. (10) “KERR, Joseph – Biographical Information.” Biographical Database of the United States Congress, 1774-present, n.d. Web. 18 July 2016. <http://bioguide.congress.gov/scripts/biodisplay.pl?index=K000141>. (11) “United States Census, 1870,” database with images, FamilySearch (https://familysearch.org/ark:/61903/1:1:M8QB-4FW : 17 October 2014), John Lee, Louisiana, United States; citing p. 103, family 803, NARA microfilm publication M593 (Washington D.C.: National Archives and Records Administration, n.d.); FHL microfilm 552,009. (12) General Affidavit of Asberry Lee, dated May 12, 1883. Witnesses: John Cullins, MFM Burton, Nelson Owens, Elie Pyles. US Army Pension, Asberry Lee, widow Isey Lee, USCT 47th Infantry, Company B, invalid pension filed February 20, 1883, application no. 473.097, certificate no. 672.879, filed in LA, widow’s pension filed January 23, 1892, application no: 538.195, certificate 370.279.